The English Renaissance has been the focus of intense interpretive activity. It has been a scene of trial for the critical methodologies of deconstruction, feminism, new historicism, psychoanalytic poststructuralism, and cultural studies. Trials of Authorship extends and challenges this theoretically informed criticism. Jonathan Crewe argues that the commitment to innovation, transgression, and radical change has increasingly obscured some powerfully resistant elements both in Renaissance culture and in these critical discourses themselves. He calls for a recognition of defensive, perverse, and self-limiting trends in Renaissance writing, and also of the conservative investment by critics in the Renaissance as a cultural epoch. Crewe focuses on the relatively stable poetic and cultural forms operative in the Renaissance. He argues that these established forms, which shape poetic composition, social interaction, and individual identity, are subject to only limited reconstruction by English authors in the sixteenth century. They facilitate and limit literary and social expression and result in more sharply conflicted literary production than current critics have been willing to acknowledge. Moreover, Crewe argues that while this literary production is dominantly masculinist, it nevertheless reveals the stresses of negotiating complex structures of class and gender, history and culture. The literary results are accordingly varied and do not lend themselves to uniform interpretation. Trials of Authorship presents a consecutive reading of English Renaissance authors from Wyatt to Shakespeare and redraws the existing picture of the English Renaissance in the sixteenth century. It does so by concentrating on authors whose canonical status is somewhat precarious, namely the poets Wyatt, Surrey, and Gascoigne, and the “non-literary” authors of two Tudor prose biographies. The book makes a case for the continuing significance of all the texts in question, while its emphasis on them also constitutes an intentional shift away from the Elizabethan period towards that of Henry VIII. This title is part of UC Press's Voices Revived program, which commemorates University of California Press’s mission to seek out and cultivate the brightest minds and give them voice, reach, and impact. Drawing on a backlist dating to 1893, Voices Revived makes high-quality, peer-reviewed scholarship accessible once again using print-on-demand technology. This title was originally published in 1990. 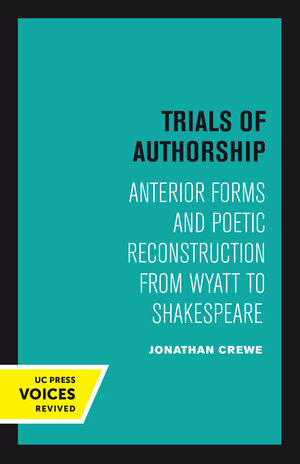 Jonathan Crewe is the Leon D. Black Professor Emeritus of Shakespearean Studies at Dartmouth College.